Developed by Shimao Group and managed by IHG, InterContinental Shanghai Wonderland is a luxury hotel built into the side wall of a formerly abandoned quarry in Southwestern Shanghai. Stretching 88 metres underground, the hotel was nominated as one of the architectural wonders of the world by the National Geographic Channel&apos;s MegaStructures series due to its pioneering architectural design. 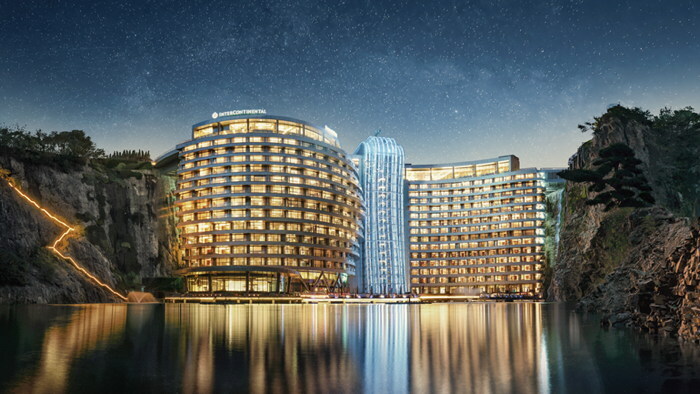 IHG (InterContinental Hotels Group) last week announced the grand opening of InterContinental Shanghai Wonderland, the 200th hotel for the brand worldwide. Developed by Shimao Group and managed by IHG, InterContinental Shanghai Wonderland is a luxury hotel built into the side wall of a formerly abandoned quarry in Southwestern Shanghai. Stretching 88 metres underground, the hotel was nominated as one of the architectural wonders of the world by the National Geographic Channel's MegaStructures series due to its pioneering architectural design. Founded in 1946 by aviation pioneer, Juan Trippe, InterContinental Hotels & Resorts have been on the forefront of luxury hospitality industry for decades with an extensive and growing network of unique hotels and resorts in stunning locations around the world. The new-build InterContinental Shanghai Wonderland combines the brand's signature luxury with revolutionary design at a wonderfully unique location, creating an unprecedented experience that will forever change the global hospitality landscape. Continuing the brand's dedication to providing high standards of guest service and delivering captivating destination experiences, InterContinental Shanghai Wonderland offers services and facilities signature to the InterContinental brand. The award-winning InterContinental Concierge adopts the brand's "In-the-Know" approach and features a series of curated experiences to help guests discover the beauty and charm of the destination. Located right above water level in the hotel's rock quarry architecture, the Club InterContinental lounge offers a range of exclusive services and benefits for its guests. Lin Wang, Chief Marketing Officer, Greater China, IHG, commented: "We are delighted to be joining forces with Shimao Group again to open InterContinental Shanghai Wonderland – an architectural masterpiece which is a wonder and beauty in the global hospitality industry. IHG has maintained staggering growth since entering the Chinese market in 1984, and the opening of InterContinental Shanghai Wonderland marks a significant milestone in our development strategy and further enhances our luxury portfolio in China. With its exceptional experiences and personalised services, the hotel is ready to welcome guests to a world of alluring luxury and natural wonder, inviting everyone to live and enjoy the InterContinental life."